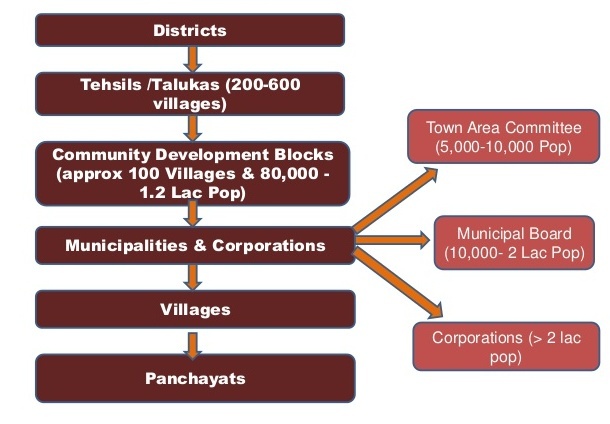 Considering the divisions of the state Uttar Pradesh, there are 75 districts, 18 divisions, 822 blocks, 52021 Panchayats and 107452 villages. Uttar Pradesh is the fifth largest state in India in terms of land area. The land area of Uttar Pradesh is 240,928 km;. A district collector monitors a district. In Uttar Pradesh, he is also known as a District Magistrate or DM. He is an officer from IAS or PCS who gets a promotion as an IAS officer on the basis of tenure in Provincial Civil Services UPPSC. A District Magistrate is appointed by the Government of Uttar Pradesh. A District Superintendent of Police or DSP is also known as a Superintendent of Police. A DSP heads the District Police organization of the state police as per the Police Act of 1861. A Sub division Police is under every sub division. The sub division Police is headed by a Police officer of the rank of Assistant Superintendent of Police or DSP (Deputy Superintendent of Police). Every ministry and the respective department are headed by a minister.